France is a top ski destination but Christmas holidays are always a special time of year in all our ski resorts. Your winter ski holidays in France : French ski resorts offer are an incredible festive experience with local celebrations to keep everyone entertained. Our family ski deals are also a great way to enjoy a classic white Christmas. But watch out Christmas ski holidays are selling fast since ‘Weather Santa’ delivered well over a metre of snow in early November securing some excellent conditions for December. The top-selling deals won’t last long, so it is never too early to book ! If you love skiing, taking a ski holiday during the Christmas break is also a nice opportunity to bank some great early ski conditions. You can always come back for more in half term even just for a cheeky skiing weekend. This year the dates allow a holiday of up to 10 days for just 3 days off work and with our new flexible arrival and duration policy you are free to come and go when it suits your schedule best and make some of the first fresh tracks of the season. When it comes to Christmas and New Year ski deals, Pierre et Vacances specifically recommends Arc 1950 and Flaine. You will love the ski in and out convenience of the Arc 1950 Village and every night there is a different way to celebrate from fireworks to toasting marshmallows with hot chocolate and vin chaud on the fire pit, and the kids will love the arrival of ‘Skiing Santa’! You can celebrate both Christmas Eve with a gourmet French dinner and champagne bubbles and on Christmas day many of the restaurants serve Turkey with all the trimmings. Over in in Flaine Christmas is also big and well adapted to lots of International guests! More fireworks, torchlight descents, shows and concerts, and an exceptionally family friendly ski school to help the kids make the most of their trip. *Offer valid on stays from 4 nights minimum on the accommodation only (excluding ancillary services and transport costs), until the stock of apartments allocated for this purpose is exhausted. Offer not retroactive and cannot be combined with any other promotional offer or discount. The price shown is per accommodation, for a Apartment Standard 2 bedrooms, 6/7 people from Sun 21 Apr to Sun 28 Apr 2019 . A festive resort in the heart of the Paradiski ski area. The price shown is per accommodation, for a Apartment Eco-Standard 1 bedroom, 5 people from Sun 21 Apr to Sun 28 Apr 2019 . The Val d'Isère Tignes village, its exceptional snow and Olympic reputation. A 4-star residence located at the entrance to Tignes Val Claret. 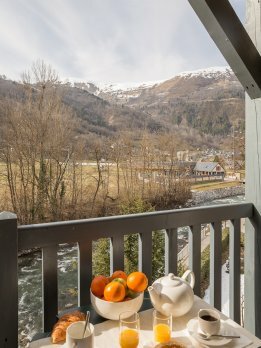 Savoyard-style architecture and comfortable apartments. The price shown is per accommodation, for a Apartment Standard 2 bedrooms, 6 people from Sun 21 Apr to Sun 28 Apr 2019 .